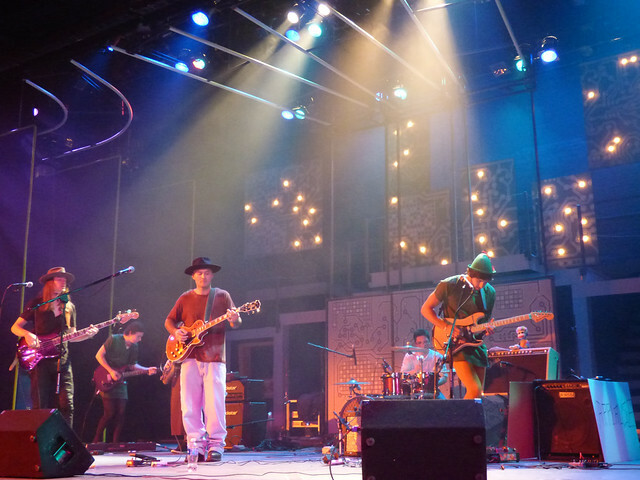 Pioneer Records produced its first Rocktoberfest at the Pittsburgh Playhouse, collaborating with students and staff from Point Park's Conservatory of Performing Arts. "This was the first concert at the Playhouse and the first of many future collaborations between our two schools," remarked Ed Traversari, M.B.A., associate professor of sports, arts and entertainment management in the School of Business. The Oct. 31 event kicked off with a performance by Chase and the Barons, the newest band to be signed to the Pioneer Records label, who played songs from Shrek's soundtrack. Additionally, Grandadchilds, featuring Pioneer Records artist John Kono Rushlander, SAEM graduate Tyler Mclaughlin and SAEM student Evan Pearson, performed the band's original songs "Crystal Ball," "Go Around Come Around," "Reaper Man" and "Billy Raynes." The concert ended with Chase the Barons joining Grandadchilds on stage to perform a cover of "Crossroads," by Robert Johnson. "I'm honored to be part of the Pioneer Records team. The possibilities are limitless if we keep up the hard work," said Chase Barron, lead singer and a senior multimedia major from DuBois Area Senior High School in DuBois, Pa.
"Point Park's urban university is a creative melting pot for artists like me," Barron added. In addition to the performances, tickets to upcoming concerts for Daya and The 1975, were awarded to lucky attendees. To produce the event, Pioneer Records student apprentices were responsible for booking the bands, coordinating the schedule, marketing the show and more while Playhouse staff and students worked the sound, lights, stage and box office. "This experience was a great opportunity to find out the types of responsibilities a promoter has when putting on a concert," explained Ericka Thomas, Pioneer Records operations director and a junior SAEM major from Avonworth High School in Pittsburgh, Pa.
"Being on the Pioneer Records team puts me in a real-world environment while still getting the chance to learn in an educational setting," said Samantha Bowes, marketing/publicist/promotions manager for Pioneer Records and a senior SAEM major from Maplewood Junior-Senior High School in Meadville, Pa.
"It was great to partner with the Pittsburgh Playhouse and COPA," Bowes added. According to Kim Martin, producing director for the Playhouse, more than 20 theatre production majors were involved with loading in the bands, soundchecks and soundboards. "It was a valuable learning experience for the students to be able to produce an event at their own school's venue," Martin said. "The bands were great and we had a blast. It was a rockin' good time. Can't wait to do it again."